The stories of Japanese communist Takiji Kobayashi represent the best of proletarian literature. In 2008 one of the best-selling novels in Japan was an eighty-year-old novel: Kanikosen (Crab Cannery Ship) by the communist author Takiji Kobayashi. The book is a story about a crew of fishermen who rebel against the wretched working conditions on a Japanese crabbing ship by going on strike and attempting to take over their ship. Amid the global financial crisis, the novel, previously selling a moderate five thousand copies per year shot up to sales of five hundred thousand. Four new manga versions were also produced, and in 2009 Japanese director Hiroyuki Tanaka (Sabu) made a film based on the novel. Kobayashi’s work touched a nerve in contemporary Japan, plagued by growing inequality, insecurity, and the effects of a two-decade economic slump. Kanikosen laid bare not only the grueling reality of capitalism, but also the possibility of united resistance by workers. Although Kobayashi’s Crab Cannery Ship has been in English translation since 1933 (albeit as an incomplete text), it has long been out of print. But two years ago a new collection, translated by Zeljko Cipris into sharp, vivid prose, was published by University of Hawaii Press. The volume contains not only the full Crab Cannery Ship, but also Yasuko and Life of a Party Member (both in English for the first time). Takiji Kobayashi was born in 1903 in the village of Shimokawazoi in northern Japan. His father was a small landowner, but an uncle had lost the family fortune in a failed business venture. In 1907 Kobayashi and his family moved to Otaru on the northern island of Hokkaido. Kobayashi worked at his uncle’s bakery during elementary school, moving on to the municipal Commercial School and later the Otaru Higher School of Commerce, where he graduated in 1924. At university Kobayashi became aware of his family’s contradictory class position as former landowners and farmers, and he came to identify with oppressed factory workers and farmers. The class struggles spurred by the Meiji Restoration and the negative effects of capitalist modernization would inform Kobayashi’s greatest stories. The 1868 Meiji Restoration — a revolution from above that ended the feudal isolation of the Tokugawa shogunate and transformed Japan into a world power — had profound implications for Japanese society. The government abolished the old feudal caste system, subsidized industrial development, and made landlords dependent on the state. Manufacturing output rose dramatically in the years leading up to World War I as workers moved out of agriculture and forestry into small, rural factories. The rise in factory work brought social change — women were employed in wage work in large numbers for the first time — but also immiseration. Japanese women employed in the cotton, silk, and weaving industries suffered severe discrimination and oppression from their male employers, and factory work brought long hours and low wages for both men and women. Although the cities saw economic growth and the spread of wage work, the countryside remained marred by high levels of unemployment and deep poverty. Japanese workers doggedly attempted to improve their working conditions. Early worker struggles took place in the mines in the 1870s and 1880s, and rickshawmen and printers formed unions in 1883–84. In the two years following Japan’s 1905 peace agreement with Russia, strikes erupted in key sectors of the economy like shipping and mining. Unionization was hindered by severe government repression and toothless labor laws. Unions like the rickshawmen’s were routinely destroyed, and in 1910, twenty-four Japanese socialists and anarchists were accused of plotting to kill the Emperor. Eleven were executed. The Japanese state was also extremely undemocratic. The Diet, the country’s parliamentary body, was elected by only two percent portion of the population, and served the interests of the wealthy classes. Universal male suffrage wasn’t instituted until 1925, and women did not gain the vote until 1945. Despite these hurdles, the Left grew in prominence during the first half of the twentieth century. 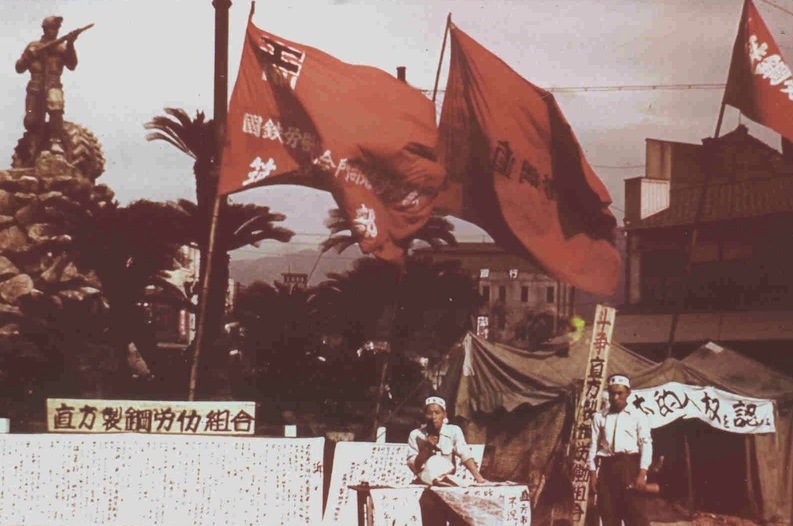 Early Japanese leftist movements was diverse — Christian humanists and Gomperite business unionists joined anarchists and Marxists. After 1917 Marxism became the predominant force on the left and held wide appeal for Japanese radicals. The first Japanese translation of the Communist Manifesto came in 1904, followed by portions of Das Kapital in 1907, which sold three hundred thousand copies on its first release in Tokyo. Following World War I, Marxist works were translated at a feverish pace in Japan: between 1927 and 1933, the complete collected works of Marx and Engels (twenty-seven volumes) and a ten-volume collection of Lenin’s works were published in the country. The hunger for Marxist literature in Japan coincided with an intense period of organizing and state repression. During the 1918 Rice Riots — sparked by falling wages and rising food costs — some ten million people took part in 636 separate revolts. Major strikes (which were crushed by the army) occurred in 1920–21, and students inspired by the Bolshevik Revolution began building organizational ties with factory workers and peasants. There was also great agitation in the countryside — 7,115 tenant strikes took place between 1920 and 1924, and this jumped to more than 19,000 between 1930 and 1934. The devastating 1923 Tokyo Earthquake exacerbated the climate of unrest and uncertainty, and sparked pogroms against Korean and Chinese immigrants. The government was especially concerned about the growing influence of the Japanese Communist Party (JCP), originally formed in 1922, immediately banned, and then reformed in 1924. The JCP was involved in popular struggles such as union organizing, tenant strikes, and the Farmer-Labor Parties. It opposed imperialist expansion and fostered a rich, vibrant political and cultural life among its members. Kobayashi was in the thick of this activity, balancing writing, organizing, and working at the Hokkaido Colonial Bank. In the late 1920s, he participated in strikes, designed posters, took part in study classes with the farmers and workers, and was involved in election campaigns for the Farmer-Labor Party (which inspired his story Journey to East Kutchan). In March 1928 the police arrested approximately 1,600 real and suspected communists. Following the arrests, Kobayashi wrote a short story based on the event entitled March 15, 1928 that vividly detailed the arrest and torture of communists and labor activists at the hands of the police. The story, published in late 1928, sold eight thousand copies before being banned — bringing Kobayashi critical acclaim, but also the attention of the police. Kobayashi was elected in 1929 to the Central Committee of the Japanese Proletariat Writers League, where he wrote the Crab Cannery Ship. The story led to his dismissal from the bank at which he was employed because he named several of the banks’ best customers, linking them to the exploitation of farmers. He was forced underground, and arrested by police in May and August 1930; during the latter incarceration he was tortured by the Imperial Police. In addition to lecturing, raising funds and contributing to the Writers’ League and other left journals, Kobayashi wrote prolifically during this period, despite being constantly hounded by the authorities. In 1931, he wrote the short story, Yasuko, which tells the story of two sisters who are drawn into political activism and the labor movement, and in 1932 he completed a semi-autobiographical story on his work in the JCP entitled Life of a Party Member. The following year, in February 1933, Kobayashi and a comrade were arrested, tortured, and brutally murdered by the Imperial Police. The Crab Cannery Ship is based on a 1926 mutiny on a Japanese fishing ship. The novel has no central protagonist, instead following a group of largely nameless, unorganized workers. Profits were just scooped up. Then very skillfully such catch phrases as “the development of national wealth” were tacked on to these enterprises, which were thus completely justified. The capitalists were very shrewd. “For the sake of their country” the workers were starved and beaten to death. The ship is a reflection of the class war that grips society — the pursuit of profit and the “glory of the Emperor” are so important that the company foreman (the real authority on the ship) refuses to suspend operations to rescue another ship in distress, allowing the ship to sink. He consoles the captain that at least the other ship was insured, and when some crew members are lost at sea, he is equally unperturbed. “. . . no rich man boss. No tricky people. No exploit people. Understand? . . .” This, the men vaguely thought, is probably what was meant by the “terrible” phrase “turning Red.” But if that’s what “turning Red” was about, it seemed to make perfect sense. Most of all, they felt strongly fascinated by what they were hearing. The Crab Cannery Ship, despite its unfinished nature (it ends just as the second strike begins) and the brutal murder of its author, quickly became the major literary work of the Japanese revolutionary left. Even though the novel was banned by the Empire until after World War II, Kobayashi’s experimental style was widely embraced, and Kanikosen was translated into Russian, English, and German. Kobayashi’s stories are not hack works of socialist realism or “party propaganda.” They contain the best qualities of proletarian literature — engrossing narratives, sharp imagery, and memorable characters, both individual and collective. His works illuminate the lives of ordinary workers, peasants, women, and party cadre from a fascinating period of Japanese history characterized by intense class struggle. Doug Enaa Greene is a member of the Kasama Project and an independent historian living in the greater Boston area. He is the author of the forthcoming book Specters of Communism, on the French communist Louis-Auguste Blanqui.